Dr. Kristopher Grady and Mr. Matt Church were selected for the 2015-16 University of Louisville Provost’s Award for Exemplary Advising. Grady and Church join a long list of exemplary advisors who have won the award since its inception in 1990. Grady and Church were selected from a distinguished group of UofL academic advising professionals who were nominated by their students, peers and/or supervisors. Grady earned the award for his role as a faculty advisor for the Department of Political Science in the College of Arts & Sciences. Grady went on to win an Certificate of Merit for Outstanding Faculty Advising from NACADA – The Global Community of Advising. Church earned the Professional Advisor award for his work as the Advising Coordinator in the Natural Sciences Division of the College of Arts and Sciences Advising Center. Church was selected by NACADA as a winner for the Outstanding Advising – Primary Advising Role award. 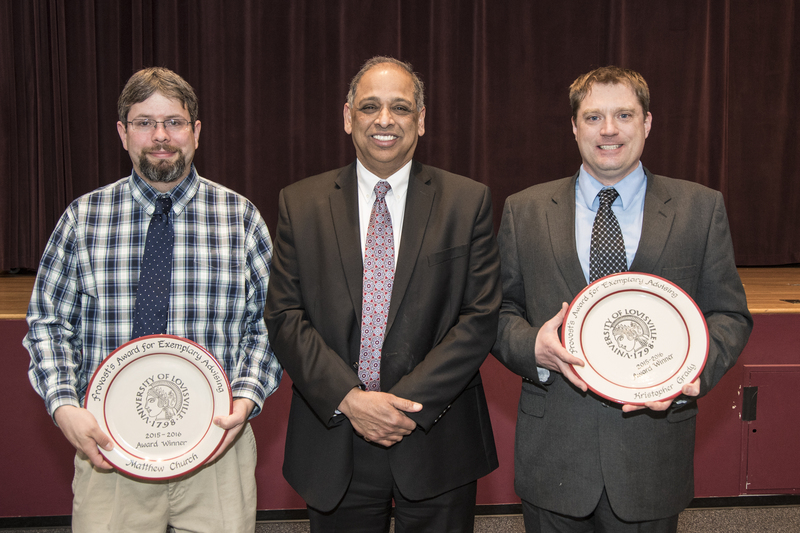 Grady and Church were honored at an on campus reception on April 13, 2016. They will be honored in October at the NACADA Annual Conference in Atlanta.